A pioneer of modern motherhood studies, Andrea O'Reilly explores motherhood's current representation and practice, considering developments that were unimaginable decades ago: the Internet, interracial surrogacy, raising transchildren, male mothering, intensive mothering, queer parenting, the applications of new biotechnologies, and mothering in the post-9/11 era. 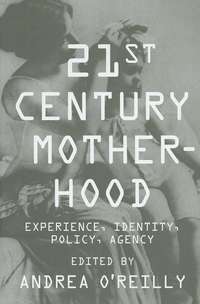 Her work pulls together a range of disciplines and themes in motherhood studies. She confronts the effects of globalization, HIV/AIDS, welfare reform, politicians as mothers, third wave feminism, and the evolving motherhood movement, and she incorporates Chicana, African-American, Canadian, Muslim, queer, low-income, trans, and lesbian perspectives.